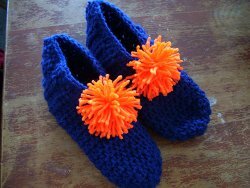 Make these Orange and Blue Crochet Slippers to help keep your feet nice and warm in the colder months. Simple crochet slipper patterns like this are fun and easy to make, and make great gifts for the holidays. Mix and match colors to create your own pair of fun slippers. The pom poms on these slippers make them extra fun to wear around the house, and when made with green and red yarns, these slippers would be so fun to wear on Christmas morning. Don't forget to make a pair for everyone in your family! These are for a size 9 women's shoe. See note at bottom to adjust size. Special Note: Beginning Ch 2 made in magic circle counts as a 1 hdc. Row 12: Ch 2. Work 1 hdc in each hdc around. DO NOT JOIN. Ch 2 and turn. Row 13 - 21: Ch 2. Work 1 hdc in each hdc around. Do not fasten off. Attach with slip stitch either at the heel or at the center front and sc in each st around for a finished edge. Join with sl st and fasten off. Make pompom to match or contrast and tie at center front. Adjust number of rows as needed to get the needed shoe size. I made the slipper 1/2 -1 inch smaller than the shoe size in inches because these stretch. Adjust by even number of rows to be able to close the heel from the outside of the slipper. These will be very slippery when worn on bare floors, so take care. What a very nice project. I read the directions and they are very easy to follow. They are basic stitches so anyone should be able to follow them. I like the idea of making them in college colors to take along. The ones shown look like the U of Florida colors. Fabric Paint makes great non-skid designs on bottom of slippers. I think these slippers are a cool alternative to beginner or advanced beginner crocheters instead of the usual sometimes boring scarf. These can be made in your school colors! What a fun gift to send with your new college student to wear in the dorms. Now, you could also do a simple stitch along the bottom of the slipper attaching a piece of leather that has been cut out using one of your shoes as a template. Or, trace around your sock foot. You can find that leather at the fabric store. Does this slipper pattern use only a single strand of 4 ply yarn? Other slippers I've made call for a double strand. I made these as Christmas gifts. Work up really fast and they are warm. I used the non-slips strips for the bathtub on the bottom of these to prevent slipping. Worked well too! Are these really made with hdc's? I am one the middle of making one and it seems really small. I am wondering if it should actually be double crochet. use puffy paint on the bottoms to make them less likely to slip. I can follow everything until this part: "Fold ends of the row together to form closing heel. I used a slip stitch to close the seam or you can sew it closed. (If you choose to sew it closed, fasten off Row 21 leaving a long enough tail of yarn to sew with.) Attach with slip stitch either at the heel or at the center front and sc in each st around for a finished edge. Join with sl st and fasten off". Since you start with a magic circle, it appears that you are crocheting in the round for this pattern. I am not certain where or how you fold ends in (what ends) or - in the next sentence - what you are attaching. this part confuses me. Can you explain further? I made these and they are very easy and fast. I did not do the pom poms. I did a front and back post double crochet (of course there was not a front and back post in this pattern to do the stitch in, so I eyeballed it and picked a stitch to create the look of front and back post) around the top, then one row of single crochet. I made a chain rope and weaved that through the double crocheted front and back post stitch and tied it off in a bow . They came out very cute and all the my son's girlfriends and the girlfriends friends are asking for them. Unfortunately I don't have enough hands to make them all. @tweety you can use any yarn you'd like! Just make sure it's comfortable to wear on your feet. I still don't understand what a magic circle is. I understand about the first loop, but it doesn't sound as if it is certain that this is what it is. Please let me know what a Magic Circle is. Strange they don't explain it, and I can't seem to find anything reference to it anywhere. I think what they are calling a magic circle is when you make your first loop to crochet, but instead of tying it toward the ball of yarn, you tie it toward the end of hat you will be working and the loop will close tighter when you pull the thread. I need a picture to explain better. Sorry I can't be clearer, but I hope it helps. What is a "magic circle"?